Okay, I will admit I am going a little bread crazy here. I just want you to know that I really love to make bread and when it is this easy, it just makes it all the better. 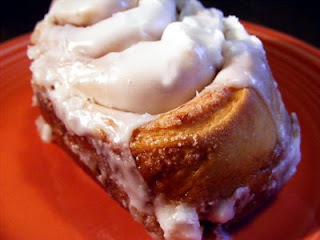 My favorite kind of cinnamon rolls are ones that I was served when in grade school. They were the best I had ever eaten, until now. This recipe is even better than those I longed for in grade school. This is the challah recipe from Artisan Bread in Five Mintues a Day cookbook, of course. Challah fresh out of the oven is almost perfect but made into cinnamon rolls it is perfect. This will make 4-1 pound loaves or 16 cinnamon rolls. Mix yeast, salt, eggs, honey and melted butter together. Mix in flour all at once. I used my Kitchen Aid and it was so easy. I have not mixed this by hand so I cannot tell you how hard it would be. After all flour is mixed in cover and allow to rest at room temperature for 2 hours. You can now make challah or cinnamon rolls. We are going to make cinnamon rolls. So here goes. Roll out dough to 1/8 inch thick and in a rectangle. Spread 1 stick of softened butter evenly over dough, now sprinkle 1 cup of white sugar over butter evenly. This is when I take 1 T of cinnamon and sprinkle over the sugar. I don't like to mix the sugar and cinnamon together. That is just me, you can if you want. Roll up very tight and seal the end with a little water. Cut into 2 1/2 inch slices, place in a DEEP cake pan. If you don't have a deep cake pan use a loaf pan. I did not the first time I made these and had to clean up a very messy oven the next morning. Bake at 350' for 40 minutes. When cinnamon rolls are still warm ice. Icing is made by combining powder sugar, syrup and cream until smooth.